From Japanese bowls in all shapes and sizes (noodle bowls, miso soup bowls, rice bowls, and more) to flat soy sauce dishes, tiny ceramic chopstick rests to rustic handle-less teacups, there is no doubt that the world of Japanese tableware is a rich and varied one. A typical Japanese table setting involves a series of bowls in plates in different, mismatching sizes and patterns, all carrying their own separate portion of the meal and looking like an abstract, yet balanced and aesthetically pleasing conglomeration of culinary delight. It has been believed for centuries in Japanese culture that tableware is just as important as the meal itself. Having the appropriate Japanese miso bowls, soy sauce dishes, teacups and other tableware for your Japanese meal is thought to be absolutely essential, because it is impossible to enjoy your meal to its fullest unless you are able to appreciate it for what it is. Read on to discover more about the history, artistry, and variety of Japanese tableware. If you are wondering where to buy Japanese tableware in all its forms, take a look at japancentre.com's Bento & Kitchen section for a great range of Japanese or Japan-inspired wares. The art of designing and arranging Japanese tableware dates back to the 16th Century. Unlike the perfectly matching settings we tend to see in the UK, Japanese table settings comprise of plates and bowls arranged in a balanced yet asymmetric way, with no two pieces matching each other. It has been said that Japanese table settings are like abstract paintings. A tray may be placed at each setting, with all of the tableware placed within it. The tray acts as a ‘frame’ for the setting. Chopsticks are set in front of all the plates, the thinner end facing towards the left and resting on a chopstick rest. The ‘main’ component of the meal (meat, fish, noodles) is set either in the front just behind the chopsticks, or in the middle. Side dishes, bowls, and cups are arranged around the main dish so that everything looks balanced but asymmetrical. A lot of Japanese tableware has a rustic appearance, with uneven rims, abstract paintwork, and crooked edges. This all adheres to the appreciation of the beauty of imperfection that underlies wabi-sabi. Complete dining sets are not generally used in Japan. Instead, components from different bowl, plate, cup, and chopstick sets are combined and arranged until they suit each other. This makes for an infinite number of table setting possibilities. Arguably the most unchanging piece of tableware, rice bowls are generally small (between 10-13cm in diameter), shaped like upside-down bells (often with curved lips). They usually do not come with lids, and rice is piled in so that it looks like a little mountain that can be seen over the top of the bowl. These bowls tend to be similar in size to rice bowls (between 10-13cm in diameter) but with a more circular or cylindrical shape, and made of wood or lacquer. Miso bowls sometimes come with lids, so that when the miso is served the lid can be opened and the wonderful aromas experienced all at once. 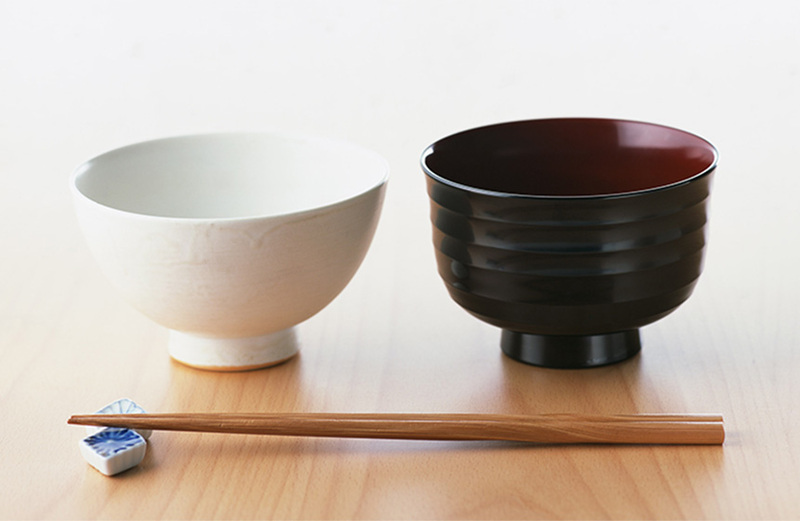 These bowls are typically used to hold one-bowl meals, like ramen noodles or donburi rice bowls. They are much bigger than rice or miso bowls (between 20-25cm in diameter) and are normally made from ceramic. A lot of care is often taken when arranging the toppings and garnishes on meals served in these bowls, to ensure that the meal looks nice in the bowl. Normally used to hold soy sauce, these dishes are shallow (2-3cm in height), small (less than 10cm in diameter), and made from ceramic. They can be circular or square in shape, and their relative shallowness makes them ideal for dipping sushi. Soy sauce dishes are also handy for holding small servings of Japanese pickles. Chopstick rests are small (between 2-4cm in length or width, less than 2cm in height), typically made of ceramic, and have dips or grooves in them for keeping a pair of chopsticks in place. Their main job is to keep the chopsticks from touching the table, which is considered very unhygienic. Japanese teacups are generally long, thin (between 8-12cm in height, 6-8cm in diameter), and cylindrical in shape (although there are many exceptions). They are almost always handleless, and their shape allows for them to be easily clutched in one hand. Perfect for sipping on sencha or matcha green tea. Browse Japan Centre's collection of Japanese tableware and find the perfect pieces for your home.